A warm sunny Rugby BC played host for the Bears opening fixture in their Midland Counties League campaign. Nottinghamshire provided the opposition, while Warwickshire won 114-110 gaining 17 points the game could easily have gone the way of the visitors. Mark Smith (Avenue Leam), Steve Taylor (Avenue Cov), Martin Timms (Welford) and Colin Jacox (Avenue Cov) set off at a tremendous pace, including a five on the fourth end to reach twelve ends 22-2 up. Nottinghamshire added eight shots in five ends to get right back into the game, Jacox and co added a single but Notts closed with a double, four and single to cut the Bears margin of victory down to 23-17. Tom Wheeler (Grange), Mal Evans (Sherwood Park), Steve Smith and Calvin Wells (both Nuneaton) held a slender shot lead at the halfway point. With six ends to play Notts lead by five but Wells’ rink dug in, clearing the deficit and taking a one shot advantage into the last two ends. A double and single ensured another rink victory for the Bears, 20-16 the final score. Mark Ireland (Erdington Court), Darren Ward (Rugby), Richard Brittan (Erdington Court) and Alan Apsey (Welford) held an early lead but were soon staying on the heels of the visitors, trailing by two midway through. Parity was gained after seventeen ends and still the case with the last end to play, Apsey and co held their nerve to pick up a double to win 17-15. Lee Maughan (Rugby), Dan Ellicott (Lillington), Craig Carter (Rugby) and Dave Fallon (Nuneaton) found themselves 8-0 down after six ends but halved the deficit to trail 10-6 after eleven ends. With five ends to play Fallon’s rink were now winning by four, after eighteen ends the scores were level. A Nottinghamshire double was replied with a treble to give the Bears a one shot lead with one end to go, Notts took the end to secure a share of the spoils, final score 18 all. Adam Smith, Rob Maries, Andy Sparkes and Andy Smith (all Avenue Leam) led by eight after twelve ends. With seventeen ends gone Notts had closed the gap to two points and then took a four to lead by two the next end. The final three ends say three singles but only one to the Bears, Notts winning 22-19. Andy Manning (Nuneaton), Graham Box, Neil Hancock and Dan Box (all Little Compton) reached ten ends one shot up. A good five end spell saw the visitors move ahead, the remaining ends were fairly level, the visitors taking the game 22-17. 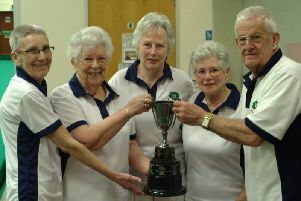 # Warwickshire’s first inter-county friendly match involved a very long coach trip down to Purley BC to face Surrey. A heavy green after some heavy rain the previous day made bowling tricky but didn’t stop the two sides playing a good encounter, Surrey winning 123-102. County President Don Darby joined by David Payne (Stratford), Brian Beere (Grange) and skip John Hibbert (Wolvey) got off to a tremendous start, limiting the hosts to just one shot in the first nine ends to lead 19-1. Surrey added thirteen in five ends to reduce the deficit to five. A nineteenth end four took Darby and co ten shots clear, Surrey could only chip a few shots off in the last two ends, the Bears winning 27-20. Tony Parsons (Corley), Mike Davies (Lillington), Secretary Michael Jackson and Peter Dymond (Thornfield) just edged the first half of the game, leading 8-7 after eleven ends. A good run took the lead to eight shots with four ends left. Heading into the final end the lead had been cut to three, the hosts scored a double giving Dymond’s four a 17-16 win. Clive Burbage (Solihull Municipal), Pat Shanley (Wolvey), Tom Duggins (Executive) and Peter Vale Humphreys (Avon) trailed by five at the midway point. That opened to six with seven ends left by was reduced to one with two ends left. Surrey took the penultimate end with a double to lead by three, in the final end Vale Humphreys and co almost completed the fightback but fell a shot short, final score 18 all. Bob Page (Grange), David Print (Lillington), Mick Lill (Grange) and Past President Brian Mace Humphries were within touching distance of their opponents after ten ends, adrift by two shots. The next seven ends saw that deficit increase five before being cut back down to three. The final two ends saw an exchange of singles, Mace-Humphries and co finishing down 14-17. Bill O’Gara (Wolvey), Ian Kendall (Grange), David Vowles (Avon) and Roger Powell (Executive) trailed by three at the midway point. With sixteen ends played the Bears trailed by eight, Powell and co halved this over the next two ends but a five on the penultimate end stopped any thoughts of a comeback. Final score 22-13 to Surrey. Past President Graham O’Donohue, Adrian Harris (Solihull Municipal), Keith Glenn and Graham Cluff (both Whitnash) started well, two up after five ends but dropped ten unanswered shots in the next five. With five ends left the deficit was now nine shots, Surrey added another nine shots before Cluff’s rink took a final end single to lose 13-30.